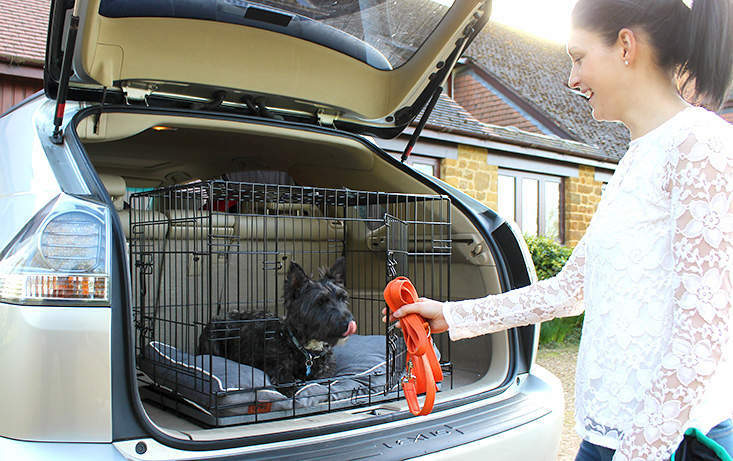 If you want a crate that's secure, can go in the car as well as in your home and is super quick to put up then the Fido Classic is the crate for you. 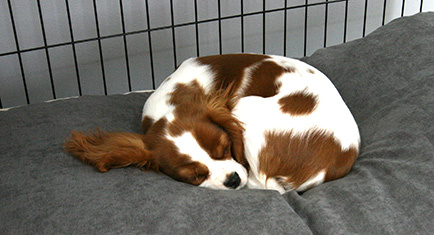 Adult dogs will love having a space that’s theirs to relax in, while it’s an invaluable housetraining aid for puppies. 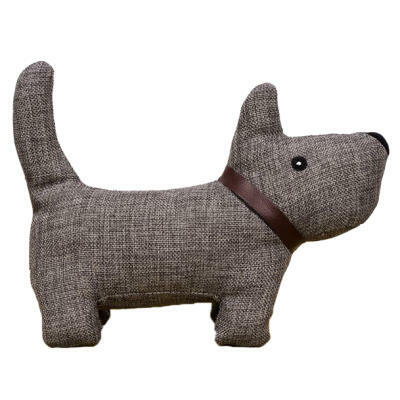 Available in 24, 30 and 36inch sizes, if buying for a puppy simply choose the right size for the adult dog. 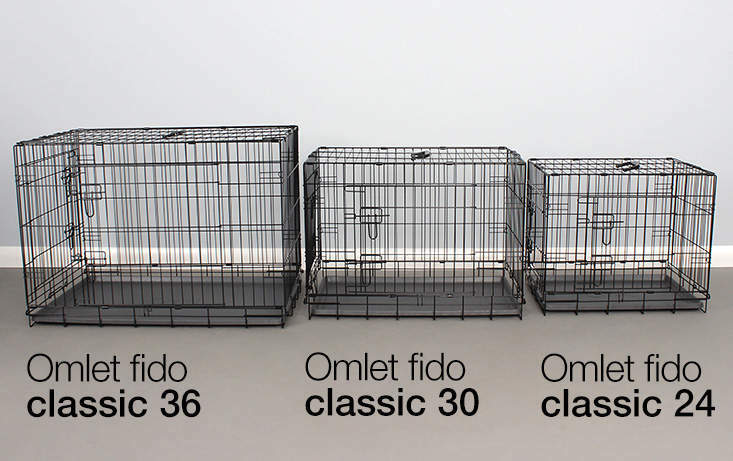 The Omlet Fido Classic dog crate has a door on the long side and the short side. 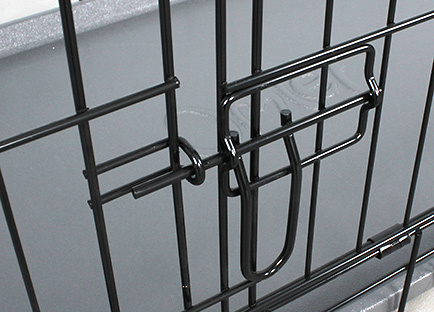 This makes accessing the crate easy and you can arrange the crate in your home so that it fits in perfectly. 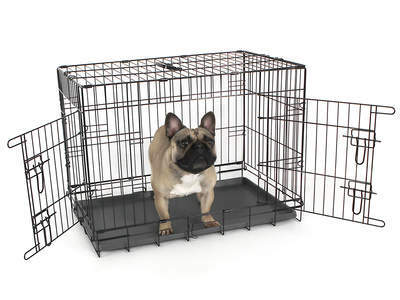 For instance if you have a narrow space you can slide the crate in and use the door on the short end. 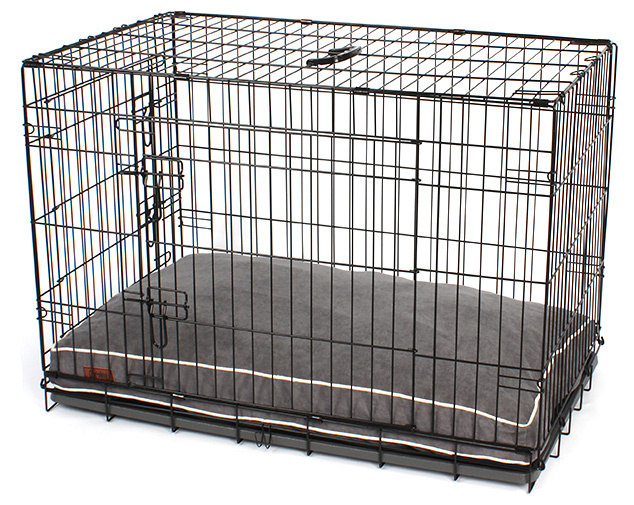 This high quality dog crate is made from heavy duty welded steel wire with a neat black epoxy coating that will look good for years to come. Each door has two slide-bolt latches that lock when you fold them all the way down. 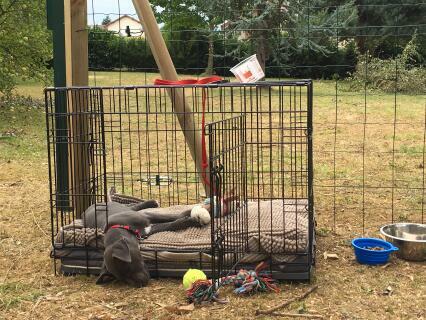 Once your puppy is completely relaxed in it’s crate you can leave the house for a short length of time, for example if you are popping to the shops, knowing that your house will not get chewed to bits! 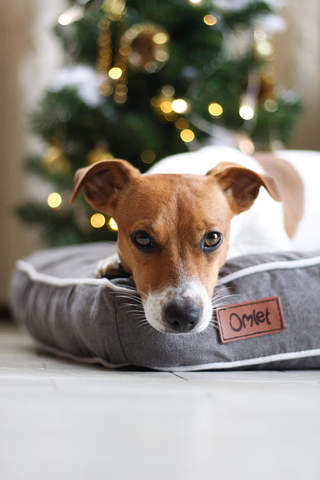 See Omlet’s dog guide for more advice on using a crate. 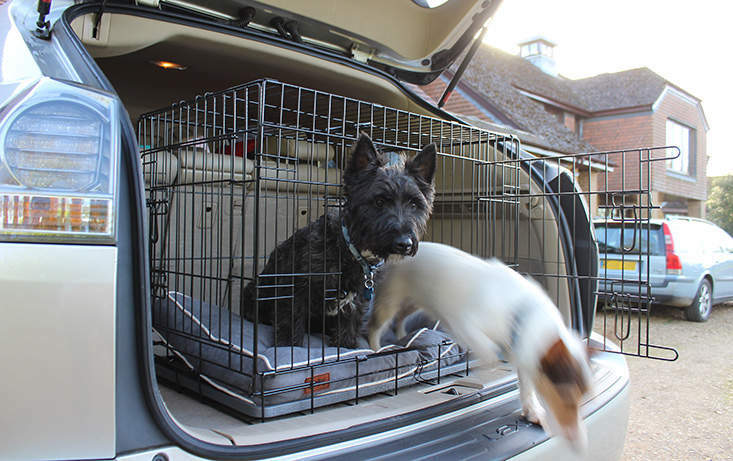 Every size of Fido Classic has an optional fitted bed. 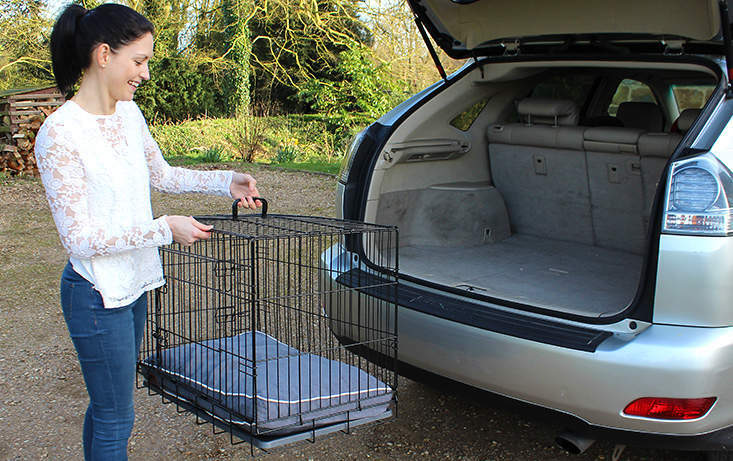 An optional extra but well worth it, this excellent value bed has been tailored to fit the Fido Classic perfectly. 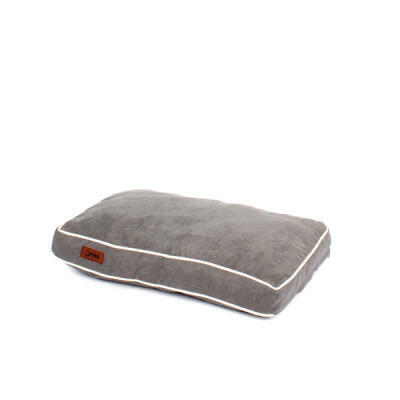 Naturally it has a removable cover and is machine washable for convenience. 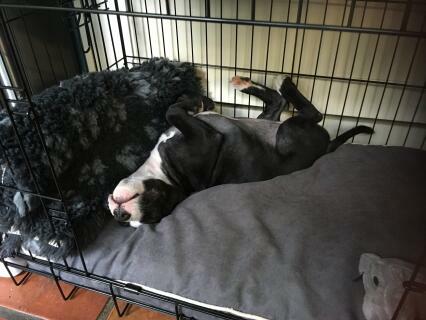 Unusually for a bed at this price it’s extra deep filled and has a very smart contrasting cream piped edge, the kind of finishing touch you might find in a Rolls Royce for much more money..
For car journeys a dog crate is essential. 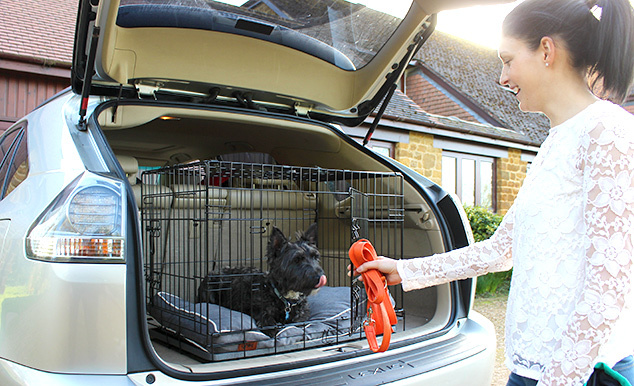 It secures your dog safely in the boot of your car and protects them from movements on the journey, it also means they can’t change the radio station. 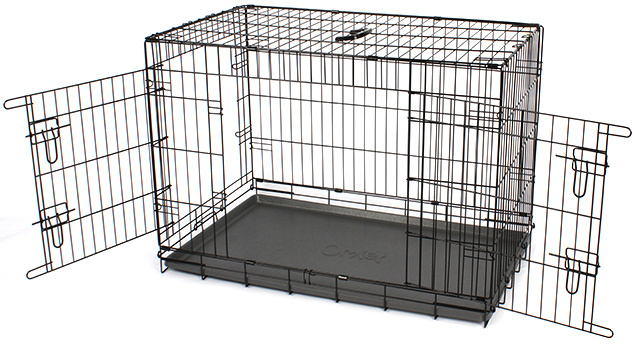 Check the dimensions of the crate to make sure it will fit in your boot with the door closed. 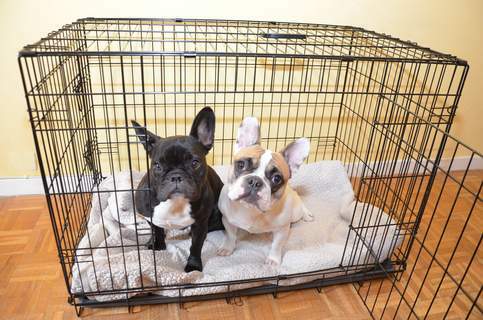 You should use a dog bed and place your dogs favourite toy in the crate. 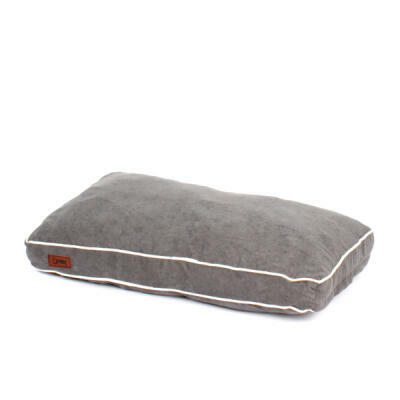 Fido Classic is easy to fold up for storage. 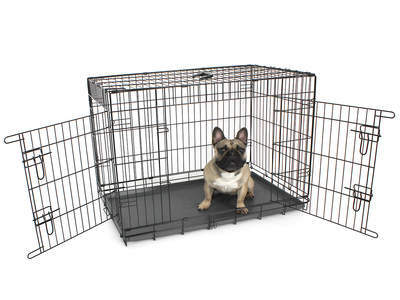 Your Fido Classic dog crate will arrive fully assembled. You won’t need any tools to set it up. 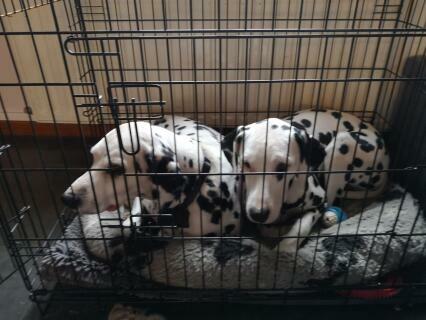 In a few simple movements, and as if by magic, the product unfolds to create a sturdy crate. If you need to move it, it has a handle on the top so lifting is easy (less easy if the dog is inside!) 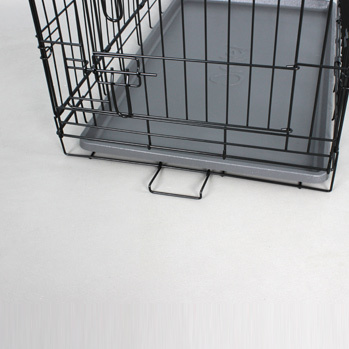 and if you want to store the crate, it folds down flat again in just a few seconds. When folded a metal loop clips around to secure it and the handle can be used to carry it like a suitcase. 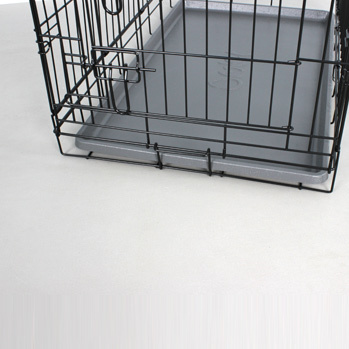 The Fido Classic comes with a plastic tray that will catch little spills and accidents that can happen with excitable puppies! 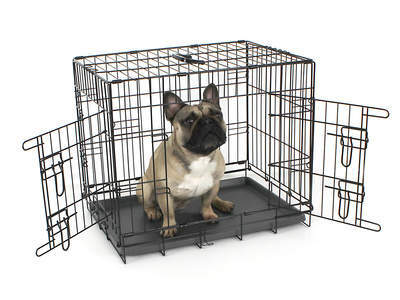 It’s also useful for older dogs and simply slides out of the crate for easy clean-ups!. 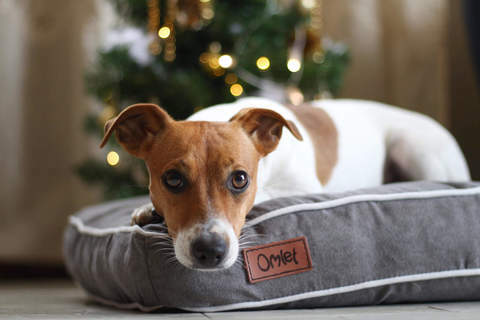 The Omlet tray comes in a distinctive dark grey with a subtle non slip textured pattern and the Omlet logo embossed in the centre. Tray unlocked - Push the lock loop in and down. 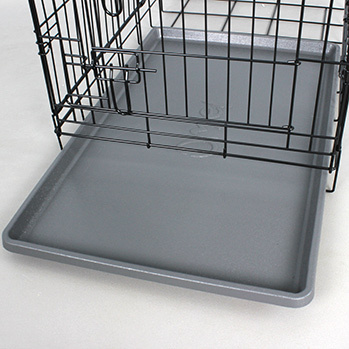 Slide out tray - Slide the tray out for easy cleaning. 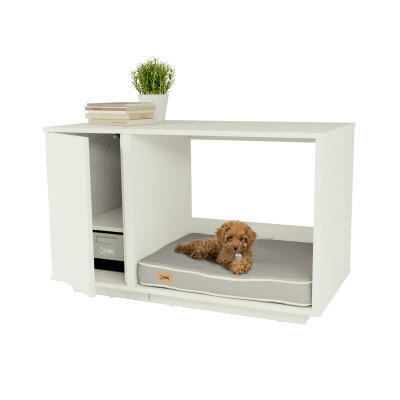 If you are looking for a more permanent crate to use in your home as your dog’s bed, then why not consider the Fido Studio, a contemporary dog crate that looks like a piece of furniture? 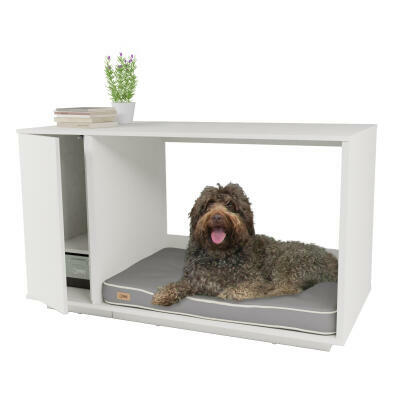 You can also accessorise it with a wardrobe that neatly stores all your dog’s accessories. 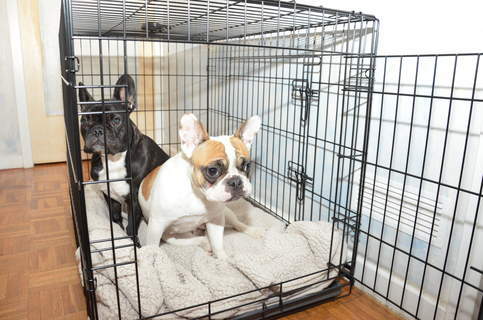 Breeders and dog professionals agree that crate training is the quickest and most effective method of housetraining a puppy. 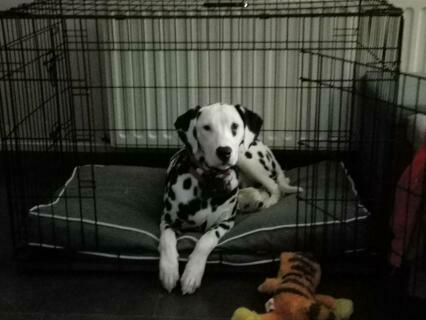 Using a crate gives your dog's its own home within your home and as such you can quickly teach it where to go to the toilet. 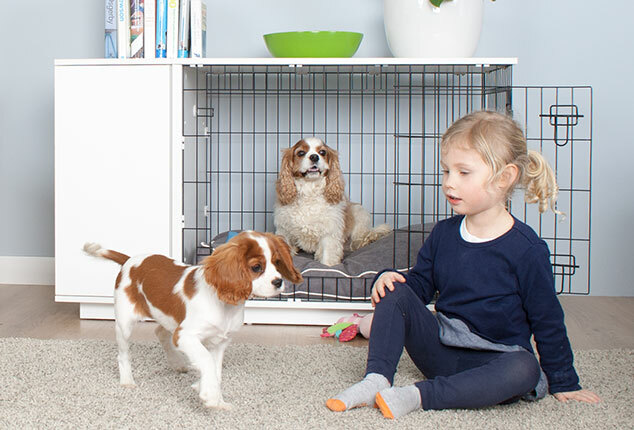 Once trained your puppy or adult dog will simply see the Fido Classic dog crate as their space that they can go to when they want to get some rest and relaxation. 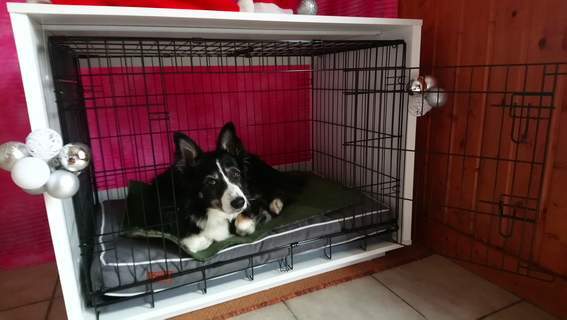 This is the first dog crate I have bought. 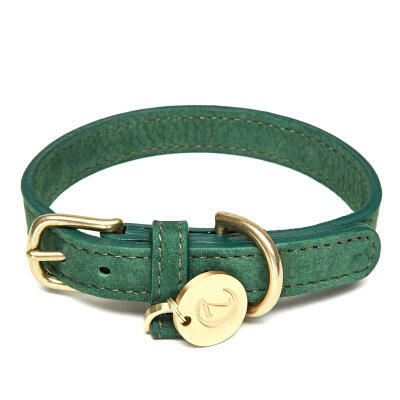 I bought it for my 3 month old puppy. 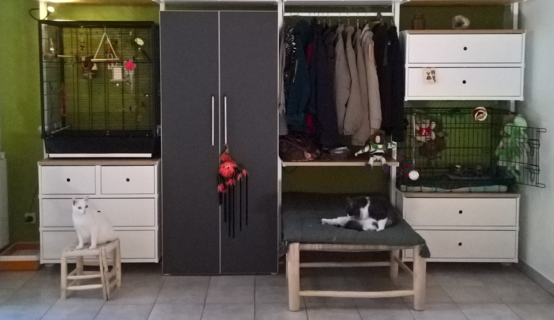 It is so sturdy neat and compact and it can easily be moved to the kitchen bedroom dining-room or lounge. 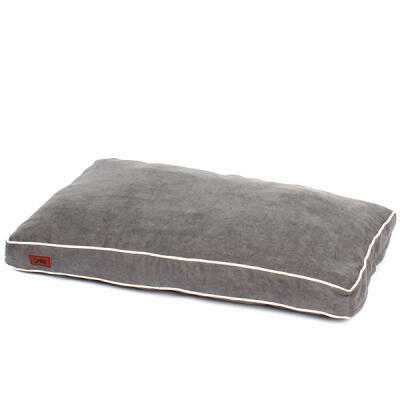 I also bought the cushion for it which is very luxurious and so comfortable for him. I can 100% recommend both products. 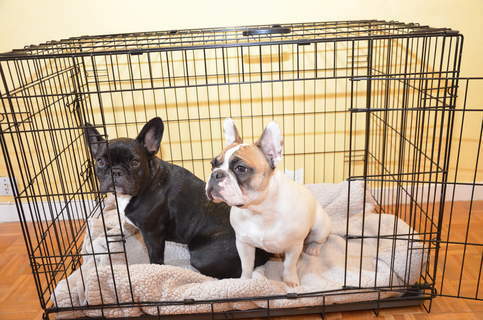 The Fido dog crate we purchased is easy to assemble, sturdy and excellent quality for the price. The optional bed is a perfect addition. 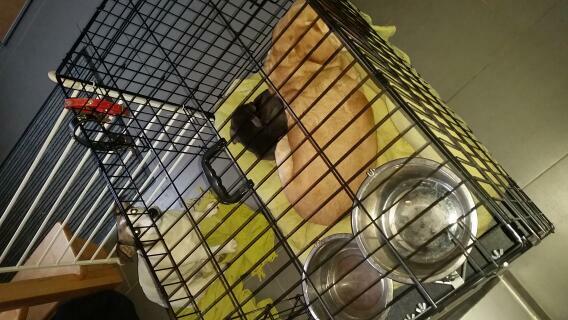 My dogs love the crate and the bed. 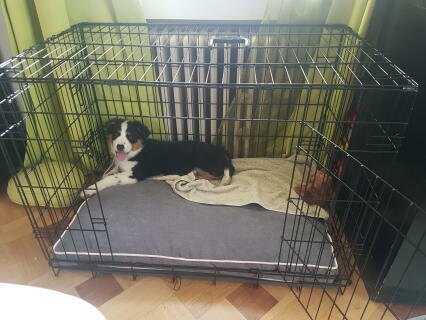 Bought this crate for our cavalier puppy and he loves it. It’s the perfect size and also looks really neat in the corner of our living room.